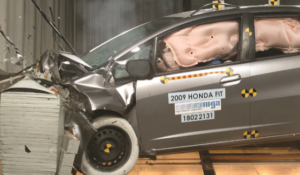 Diamond Standard on Thursday presented data that a 40 mph moderate-offset crash test of one of its CAPA-certified bumpers led to a 2009 Honda Fit seeing intrusions within the IIHS’ “Good” range. The IIHS has said that Tracy’s results might indicate increased toepan intrusion risk and did suggest increased risk to the driver’s femur, but all the results were within its “Good” range for occupant protection and evaluating vehicles for moderate-overlap crashworthiness. The IIHS also noted that many of Tracy’s results fell within the normal variance once would expect from crash-testing unmodified Honda Fits. None of the intrusion data shared by Diamond Standard appears to have exceeded the range that the IIHS suggests could be found on control 2009-13 Honda Fits. That’s an argument that the Diamond Standard bumper was “like kind and quality” on top of delivering overall “Good” safety. Diamond Standard didn’t release any data regarding the fate of the dummy or dummies inside the vehicle or on other variables examined by Tracy and the IIHS. The manufacturer didn’t directly interpret the results found by MGA Design Research Corporation in the Feb. 21, 2018, test, but Diamond Standard appeared to view the test as a success. “Here causality was isolated in a true scientific test protocol,” Diamond Standard President Michael O’Neal said in a statement. “Component testing for Diamond Standard was designed by the late Jim Hackney, Former NHTSA Director of Crashworthiness and Father of the 5 Star Crash Rating System still in use worldwide to this day. The test car had 81,704 miles before meeting its end Feb. 21. Diamond Standard reported that MGA bought the Fit and handled the testing in accordance with the IIHS protocol. (Like Tracy test firm KARCO Engineering, MGA is a NHTSA-approved crash test facility.) A “local ICAR Technician at MGA’s Request” installed the bumper beam, according to the news release. An unspecified “current ICAR Board Member” was present to observe the test, the press release stated. Some of Tracy’s aftermarket parts, including the bumper reinforcement beam, didn’t fit properly, and Burl’s Collision and Tracy decided not to force them to fit. Diamond Standard didn’t state who selected the test bumper beam or if there were any fit issues; Tracy’s had been purchased from LKQ, according to Burl’s Collision. CAPA, NSF and Keystone have all in the past been approached for comment on Tracy’s test but have not responded. The IIHS in evaluating Tracy’s test observed that his test results could only be applied to the specific aftermarket parts he used, a point which would presumably be the case for the Diamond Standard 2009-13 Honda Fit bumper beams (or other IIHS aftermarket and “cosmetic” crash testing, for that matter). By that logic, neither aftermarket parts critics or advocates can declare a win based on a single crash test, and the IIHS itself stresses that it’s not saying all imitation parts are good. This raises the question of how the insurer, consumer or the repairer bearing liability for parts choices (though Diamond Standard and LKQ offer offer partial and full indemnity, respectively) is expected to determine the quality of the other thousands of aftermarket parts on the market. Diamond Standard altered a single item on the vehicle for the crash test, which arguably seems to introduce fewer variables and related noise into the crash test than Tracy’s testing did. However, insurers often don’t write for just a single aftermarket part on a customer’s vehicle, and as Tracy notes, OEMs design multiple components to work a safety system. 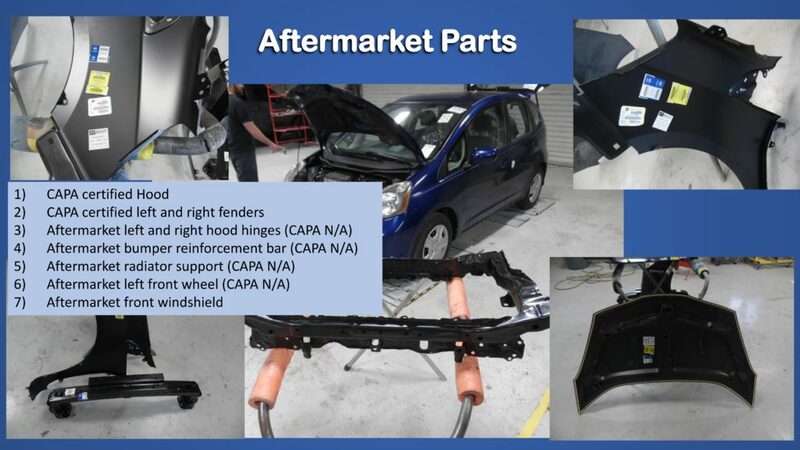 Therefore, while Diamond Standard’s 2009-13 Honda Fit bumpers might be fine, there’s no guarantee that an estimate for a Honda Fit bearing a Diamond Standard bumper but a bunch of other uncertified aftermarket parts will deliver the same crash-test performance to a customer. If each individual part was close enough to the OEM original, “the repaired system should behave the way the original behaved,” IIHS Chief Research Officer David Zuby has said. This would have to be taken to some degree on faith. Not even automakers have looked at crash-testing models repaired with every possible combination of new OEM parts, Zuby said. “That would be an impossible task,” he said. Finally, Diamond Standard and even the IIHS have yet to test parts with the small-offset protocol released in 2012 (or the new small-offset passenger safety test the IIHS is introducing). Tracy hasn’t either, but the burden of proof in this case seems to be on the aftermarket parts advocates, as a) Tracy’s already raised issues with aftermarket parts crash performance on an arguably easier test and b) the OEM parts have already been tested. Tracy released additional information and ultimately his entire data set in the days and weeks following his own crash test, and while disagreeing with his conclusions, the IIHS praised his transparency. Presumably Diamond Standard will do the same (it’s released more extensive results in the past), and it’ll be interesting to see how some of these questions get answered.